HR Solution – SMART Technologies Ja. 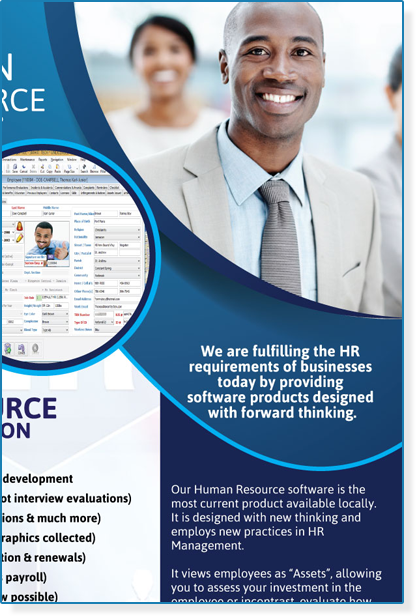 We are fulfilling thr HR requirements of businesses today by providing software products designed with forward thinking. Our HR software is the most current product available locally. It is designed with new thinking and employs new practices in HR Management. It views employess as “Assets”, allowing you to access your investment in the employee or incontrast, evaluate how much the employee is costing your company. Bio-metric security. Gain access by fingerprint scanning. Web based module for employee requests and approvals. Transnational (Approval is required before changes are confirmed) among many other features. the software allows for both vertical and horizontal security access. this means you can allow/restrict access to low level users or even users on the same level. Therefore only the HR Manager may be able to change or view another managers salary. Manage and assign all assets from laptop to uniforms. You can also do mix-matching with uniforms so you are aware of the exact stock levels on sizes and colors. Set asset lifetime and the software will give you forecasting reports telling you when your staff will need uniform and the sizes and colors to order. features of the software are self explanatory and a brief description on how to use the feature is displayed at the top of most screens. Fields are labeled according to the requirements, e.g. All red labeled fields are mandatory wherein a value must be entered. Other useful tool tips will appear where appropriate to inform the user if they are making mistakes or just for general information. users ay also press F1 or the help button at any time to get further details on a particular feature and its purpose. The application is transactional and requires approal of all requests submitted by data entry personnel. This creates an audit trail, allowing he administrator to audit the system when needed and track change due to error, negligence or sabotage. Where a module is transactional, it may be turned off if this feature is not needed by your company. Now you can track not only leave, but absenteeism, compassionate, exams and sick leave much easier then with most other HR software. You can desine your leave type including when employees are eligible but also including increments depending on years of service and specifying the duration so the system may expire the leave. The system will also auto-renew and bring forward balances where necessary and restart other leaves such as sick. Log all incidents, accidents and complaints including confrontations, customer complaints, injury on the job and even sexual harassment. Our software goes a step further allowing you to analyze the incidents and specify corrective action so it does not reoccur. The system will track these actions until you have flagged them all as being implemented allowing your to improve the operations of your company by taking corrective action to improve the infrastructure or procedures that cause conflict or injury to employees (incidents). Setup health, life and other benefits that your company offers. Set up eligibility criteria by either Job Title, Gender or Employee Type (Probationary, Full Time, Contract etc.). If your company has franchises or branches locally, regionally or internationally, as long as there is network connectivity available or internet access, authorized users of the application may access the software to do key tasks such as to approve leave, salary advance or other employee requests. Email notifications will be sent to each user informing of work-flow tasks to be attended to. Interviewers may score applicants while they are being interviewed. When you hire an applicant, the system will print all letters, job description and contracts for employees separating them by Job Titles. No more editing and printing of these documents one by one. Design courses and classes and enroll employees. Setup pre-requisite courses that are mandatory before the employee may move on to an advance level. Log training needs where noticed either spontaneously or as a result of an evaluation. A comprehensive and easy to use evaluation module. This module can accommodate applicant entry exam evaluations as well as the regular periodic or end of year performance evaluations. New to this module is the ability to perform 360 degrees, empowering your company to benefit from this exercise without contracting overseas services at high costs. Using the popular Crystal Reports engine, various reports are available and customizable for your specific needs. A data dictionary in included allowing you to use the reporting module to formulate and design your own reports.